CampusBooks.com Blog - Page 30 of 30 - All the exciting insider info on the textbook world and how it affects you. Last time, we brought to your attention that Sen. Richard Durbin, D-Ill., has introduced bill (S 945) in the U.S. Senate to regulate textbook price disclosures and posting requirements. To summarize, the bill would require publishers to offer bundled textbook materials in unbundled form, provide the ISBN and price of textbook in the course schedule, and provide the textbook requirement for each class to every bookstore that requests it. All these rules are meant to make textbooks more affordable to students. So who, in the world, would fight this bill? According to the Used Textbook Association (UTA), a group of wholesalers and bookstores that believe in the promotion of used textbooks as an affordable alternative, only 19 percent of students who have used the bundled materials find them useful. Because many bundled materials (i.e. CDs and DVDs) have one-time use codes, students have a hard time reselling the book after they are done since codes are only issued with new books. The NACS is currently working with Durbin’s staff to discuss revisions to the bill. Hopefully, the main benefits of the bill will not be watered down by the NACS’s influence. According to the NACS “Testimony to the Advisory Committee on Student Financial Assistance.” September 19, 2006: http://www.nacs.org/public/NACSTestimonyACSFA.pdf. According to the NACS “FAQ on Bundles.” April 2006: http://www.nacs.org/common/research/faq_bundles.pdf. According to the NACS “FAQ on Bundles.” April 2006: http://www.nacs.org/common/research/faq_bundles.pdf. College Store Executive. January 2007: http://www.usedtextbookassociation.org/pdf/UTA_college_store_exec.pdf. Log into CampusBooks to access your account. 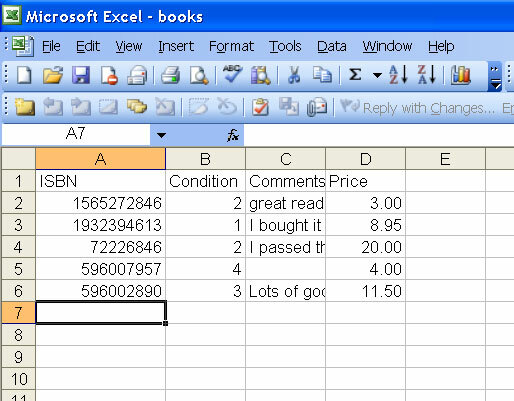 Open the Excel file with the spreadsheet that has been pre-formatted for your convenience. Go back to your account page, click on the button to upload the file and youâ€™re done! Your list of textbooks is then posted to the CampusBooks Marketplace for sale at the price that you determined. Everything–from the format of the Excel sheet to the upload process–is designed to be user-friendly and easy to understand so you donâ€™t waste time trying to figure out complicated directions. An extra hour of not having to upload textbooks online means an extra hour of lounging on the beach or doing absolutely nothing, so â€œwork smarter, not harder!â€ After all, wasnâ€™t that the point of getting a college education with those textbooks in the first place?To try out the Textbook Bulk Upload feature, just log into your account and under â€œSell Books,â€ click on â€œList Multiple Books.â€ If you donâ€™t have an account, get one free on our secure site. Please feel free to email us if you have any questions/problems! The cost of college textbook prices is climbing at four times the rate of inflation, according to information released by Illinois Senator Richard J. Durbin (D) via the State News Service in April 2007. The average student spends $900 a year on textbooks. This is ridiculous, considering that the average cost of tuition and fees at a public four-year institution is $5,836. That means textbooks make up about 15 percent of the cost of attending college! A history of the textbookâ€™s revisions and whether the textbook and supplemental materials are available in a potentially lower-priced alternative format. The price of the textbooks and supplemental material they are trying to market. 2. Requires publishers who bundle course material to offer the textbooks and supplemental material in unbundled versions. Ed. Note: Thank goodness for this one! Every one knows that those CDs included in bundled books will just end up being the most expensive drink coasters a college student will ever own. 3. Require colleges receiving federal assistance to include the ISBN and retail price of textbooks and supplemental materials in the course schedule. Ed. Note: Goody! Now we can compare prices online and order textbooks before we spend hours photocopying the libraryâ€™s edition to study for our midterm. Plus, with ISBNs given to us, there will be no chance of ordering the wrong book. 4. Require schools, when asked, to provide bookstores with access to the course schedule, ISBN numbers of course material, and the maximum and current course enrollment numbers. Ed. Note: Some colleges already provide this information, but it will make it way more convenient to be able to purchase books in bundles according to each class instead of switching back and forth from window to window comparing total overall prices. The bill has been okâ€™d by the Senate and is now waiting for approval from the House of Representatives. For more information about this bill, please visit http://durbin.senate.gov/record.cfm?id=271751. Textbook prices just keep going up, as I’m sure you’re all painfully aware! We know textbook prices are not exactly a riveting topic, but having all been college students, we know that although textbook prices are not exciting, saving money is ! We believe that it is important to keep up on the happenings of the textbook publishing world so that we can pass that knowledge on to the people who need it most: you. So check back often because we will be updating this blog at least once a week with textbook news that will put money in your pocket. For our more personal and revealing blog, check out our Myspace page at http://www.myspace.com/campusbooks. Textbook prices just keep going up, as I’m sure you’re all painfully aware! We know textbook prices are not exactly a riveting topic, but having all been college students, we know that although textbook prices are not exciting, saving money is. We believe that it is important to keep up on the happenings of the textbook publishing world so that we can pass that knowledge on to our consumers. So check back often because we will be updating this blog at least once a week with textbook news that will put money in your pocket. For our more personal and revealing blog, check out our Myspace page at http://www.myspace.com/campusbooks and add us! Please note: CampusBooks.com is not a formal news service and does not claim to be. We are simply trying to bring attention to issues that affect college students in order to help you make the most informed choices possible. Any stories we choose to bring up for discussion in the blog do not reflect our political affiliations or bias for any party. Republican, Democrat, Independent or unaffiliated, it doesn’t matter to us. Our decision regarding what stories to discuss depend on what we think will most affect you.